It was an exciting evening for all, Samantha and Andrey had a spectacular party in store for their guests, and the Detroit Tigers were at home playing game 3 in the World Series. Everyone did their part in celebrating and keeping the opposing team up very, very late. 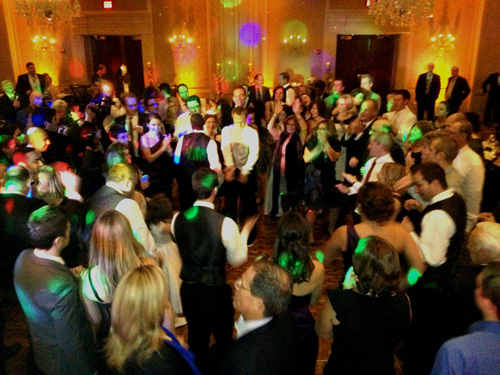 The guests could not wait for the celebration to begin, so the guest started dancing before dinner was fully completed. Samantha and Andrey held their reception at the beautiful Townsend Hotel in Birmingham. 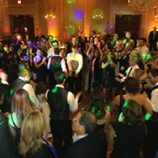 Now wether they planned this or not, this also happened to be the same place that the San Francisco Giants were staying; perhaps in an effort to keep them awake and tired, Rod and Aaron kept the dance floor packed until 2:00am! 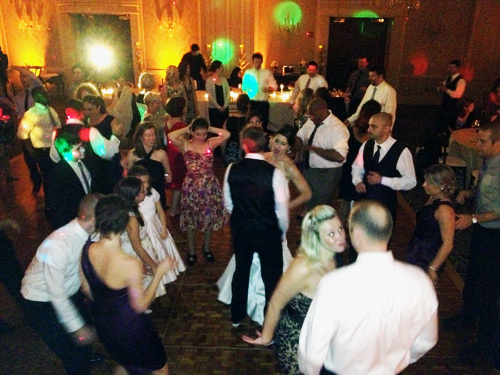 The best part of this wedding is that the dance floor was packed WAY before the bridal dances started. There was about 6 hours of dancing at this one and there was NEVER an empty dance floor. In fact, the management came to Rod and Aaron about 12:45 and said that the “Team” upstairs would like us to turn it down. What’s a Michigan DJ supposed to do when the opposing team for the World Series asks us to turn it down? Tee hee, tee hee. The most memorable part of the party was “I’d Do Anything For Love” by Meatloaf. That’s when Sam’s family serenaded her with the last song of the night. This crowd was totally in it from the word “Go!” Hand’s down- EPIC party. MBP Films, Music Box’s sister company, captured every single detail of their wedding day; their beautiful wedding film will be available soon! Look for it at our Facebook page: http://www.facebook.com/pages/MBP-Films/188515071221119 While you’re there, hit the “Like” button!